1. Fire Study – obviously I’m now obsessed with this series (thanks Lauren!) so I’m going to finish it soon! 2. I picked up Red Queen by Christopher Pike at my local Barnes & Noble a couple of weeks ago, it’s about a girl named Jessie who discovers the Witch World while on a road trip. It looks super intriguing and I haven’t really heard much about it. 3. After I finish the Study series, I’m finally going to start the Mortal Instruments series!! I’m so excited, the first book is sitting on my nightstand staring at me, begging me to read it. 4. 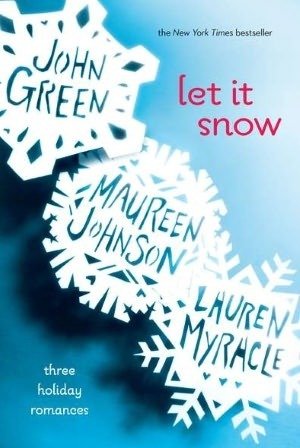 I was looking for some specific winter/Christmas books and found Let It Snow which is a collection of short stories by John Green, Maureen Johnson, and Lauren Myracle – I’m definitely going to read it around Christmas. 5. Winterspell by Claire Legrand is the first in a series inspired by the nutcracker and I am SERIOUSLY excited about it. Hopefully I’ll be able to track down a copy at one of the book stores around here. 6. I recently picked up Comfort & Joy by Kristin Hannah in a moment of weakness while walking by a bargain book rack. Joy Candellaro is at a crossroads at her life (and it’s Christmastime). She basically runs away from her life and meets a six-year-old boy who has just lost his mother and is facing his first Christmas without her, and Joy is there to help him and his father, Daniel, heal. Sounds like a real tearjerker! 7. I’m not typically one to pick up a book of short stories, but I have to read My True Love Gave To Me, which features twelve short holiday stories from various authors. The perfect holiday love story book! I’m sure it will be a mixed bag of awesome stories and TLDR, but I’m excited. 8. 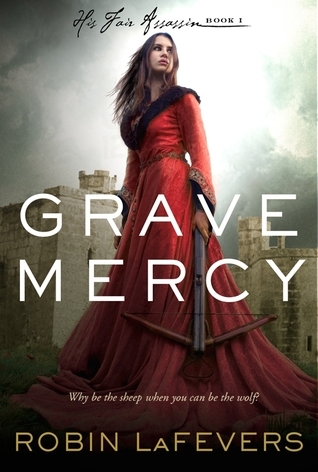 Grave Mercy by Robin LaFevers looks faaaabulous, and I received a copy through Net Galley. I’m going on my honeymoon next week (!!!) and this will be a fantastic book for the long hours on the plane and at the airport (and let’s be real…the pool, hotel, etc! You can’t put two book nerds on a honeymoon and expect them not to read!). 9. The Paper Magician by Charlie Holmberg is about a girl who practices paper magic under the apprenticeship of a man named Thane. An evil dude shows up, rips Thane’s heart out, and Ceony is forced to face the evil magician to save her teacher’s life. It sounds unlike anything I’ve read before (paper magic?!) and I’m very excited to have this on my shelf! 10. Can you tell that I’m on a fantasy kick? I really want to read Princess of Thorns by Stacey Jay. It’s a fantasy-adventure about Sleeping Beauty’s daughter, who is a warrior princess who is trying to save her brother. Quests, adventure, magic, spells…I’m all over it! I really enjoyed Winterspell. It was a bit weird at times, but overall interesting. I really liked the nutcracker retelling and wish there were more book retellings for that! That makes me even more excited to read it! I think I will probably bump it up and read it before I start the Mortal Instruments. Great lists 🙂 I love the sound of Let It Snow, I’m a total holiday junkie. Doesn’t it sound great?! I’m not usually one for short stories but you can’t go wrong when John Green is involved.